It seemed like it would never happen out here on the East coast, but summer is finally on its way. We often have warm sunny days in the spring and this year is no exception. It is early spring and I have already been in shorts a few times this season. Having had a winter baby I am in the unlucky group of those that will have babies that are not quite 6 months old by the time summer starts to roll out and most sunscreens advise that babies be at least that old before you start applying daily. I refuse to be a shut in, but protecting my little baby from the sun is a priority. Sunscreen seems like the obvious choice, but for those babies who are under 6 months there are also a number of other options to consider. Many companies now make full sunsuits (to the wrists and ankles) for babies and children that are fully SPF 50 protected and offer great coverage. I like Nozone, a Canadian brand sold online and at Mountain Equipment Coop, and I also discovered Sunseals UV Swimwear this year, which makes ridiculously cute options. 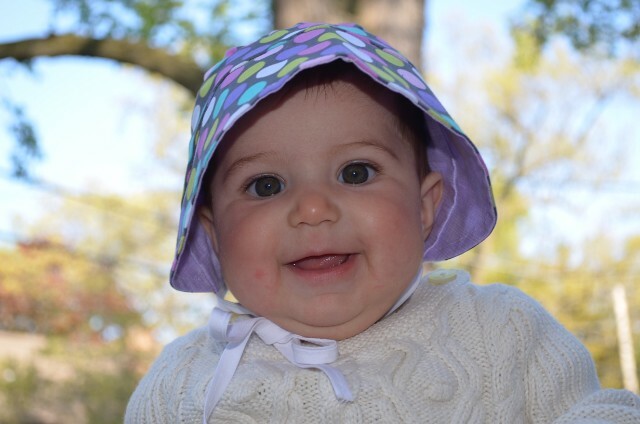 E is modeling their very pretty baby suit below with coordinating hat of course. Choose hats that are made of SPF protective materials (there are many, many options in today’s market place so it really comes down to style) and ones that offer full coverage of the face and neck. If you are wearing your baby and find that a full coverage hat isn’t working because it is getting squished against the carrier, try a bonnet. Many companies make fantastic bonnets now and you can also find custom made ones on Etsy. 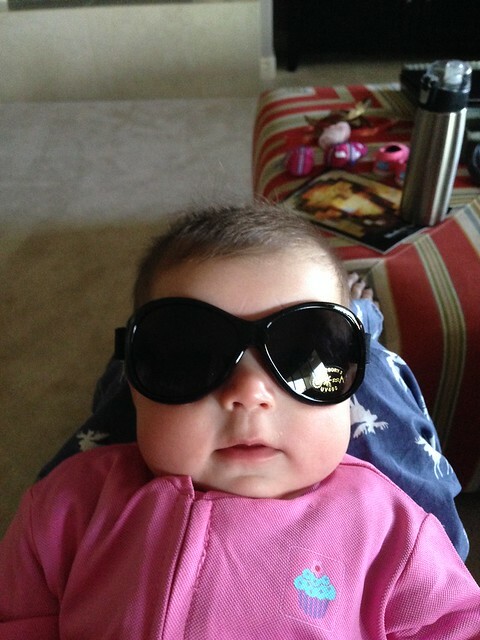 Many parents forget that babies need eye protection too. Most of us wouldn’t dream of leaving the house in the summer without our sunglasses on. There are a number of great and affordable options for sunglasses for babies and kids these days. Baby Banz have great glasses with straps that help keep the glasses on and Babiators offers super flexible (un-breakable) frames that include a replacement grantee within the first year (which is pretty awesome if you ask me). Companies like iPlay make play clothes for babies and children that are fully SPF protected. This is a great option for when you know you’ll be out and about, but not visiting the pool or splashpad. I love me some Babylegs. These ingenious little baby leg warmers offer full leg protection when babies are in shorts or skirts and now come in SPF protective materials. These little gems also double as an extra pair of pants in the event of a major diaper blow out – and we all know those can be amazing in the summer with no pants to contain them. Seems like an obvious one right? You can create shade with special SPF protected sun shades for the bucket seat and stroller as well as on-the-go pop-up tents. This makes getting around and spending the day out much easier. Jolly Jumper makes very affordable (around $20) UV shade covers for the stroller and they are universal to fit just about any stroller on the market as well as over any standard sized pack and play. Wait, didn’t I just say that sunscreen is not recommended under 6 months? Yes I did. However, there are now many medical professionals, including the American Academy of Paediatrics, who agree that while it isn’t as ideal as no exposure at all, small amounts of fragrance-free, zinc-based sunscreen is safer than a sunburn. Babies are stressful little creatures at the best of times. Seeing a baby or even a small child with a sunburn makes me want to cry as sunburns are preventable. Keep your little ones safe this summer and sunburn-free. And while you are thinking about protecting your baby, don’t forget about your own eyes! I love shopping online for sunglasses and designer eyewear and I got a pair of Oscar de La Renta sunglasses recently from SmartBuyGlasses.ca. Love how easy it was to order and got them delivered in a short amount of time! How else have you kept your baby safe from the sun? We’ve got all kinds of sunglasses…..on a mission to get some good hats for coverage. I’ve seen some great bonnets being made…. 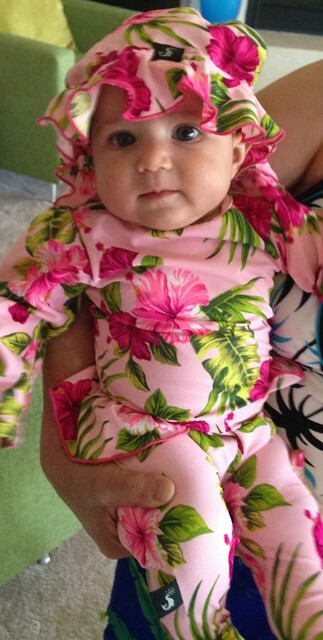 Love the floral swim suit pictured above, way too cute! Gotta check out Sunseals! If our little baby is a girl, I will be making her lots of bonnets! I have been reading Jen Shragge’s tips for protecting young babies from sunburn. My babies are adults now and i am happy to see that parents may buy protective clothing and eyeglasses for their little ones. I like the idea of shading on a stroller so one can take baby for a walk and sill keep him/her from the strong sun. Going out before 10 a.m. or after 3 p.m. when the sun is not as hot. .
Oh my goodness, the sun suit is so adorable!!! Wow didn’t know there was so much baby stuff to protect them from the sun. Thanks for the info! I adore that little sun-suit. Protecting children from the sun’s harmful rays is so important that it can’t be emphasised enough. Thanks for these tips! We have a 4 month old grandson and a granddaughter due in a couple of weeks, so these tips are very timely for us! I’m going to pass this post on to both of my daughters! These are great ideas! I hadn’t thought of sunsuits! What an adorable sunsuit…this is the first time that I have seen something like this…it is great! If you are able to finish several achievements, you’ll be rewarded with gems. In the Achievements category, Google play games users unlocked 3.
is helpfully highlighted to stand out from the lengthy list. I actually want a UV umbrella myself but, don’t know where to get it in Toronto except through Amazon.com. I’m glad to know there are baby clothing to protect them as most of the sun damage that emerges later in life actually take place during the early childhood years. I see so many people who just don’t seem to realize how important this is. This is good information. I make sunhats (to give away) and bonnets, too! I have a few I made for me, too, and wear them year round. Doing everything you can and wisely, to make sure they aren’t just covered up but that the rays won’t pierce through is something more people need to communicate. Also I wonder how many doctors comment when a parent brings in their child and they can see a sunburn.